Stern warning: Any Israeli prime minister who dares undermine the Land of Israel or disengage from parts of it "may be disengaged from this world," former Chief Rabbi Mordechai Eliyahu said in an interview with an ultra-Orthodox weekly. Addressing pulsa denura ([pseudo-]Kabbalistic death curse) ceremonies performed against Prime Minister Ariel Sharon, Eliyahu said: "There is no person in the world who can perform a pulsa denura. The only one able to do a pulsa denura is the Land of Israel." "In the past, some leaders undermined the land of Israel and gave away parts of it, and later they suffered grave disasters," the rabbi said. "There's no reason to name any names. When they asked me to pray for their health, I said first we will pray for their mental health, and later for their physical health." The rabbi issued another stern warning, saying that "the land of Israel pays whoever undermines it in this world already – and in cash." "Everyone who spoke about concessions was hurt, and certainly those who didn't make do with talk and really undermined it, and the list is long," Rabbi Eliyahu said. 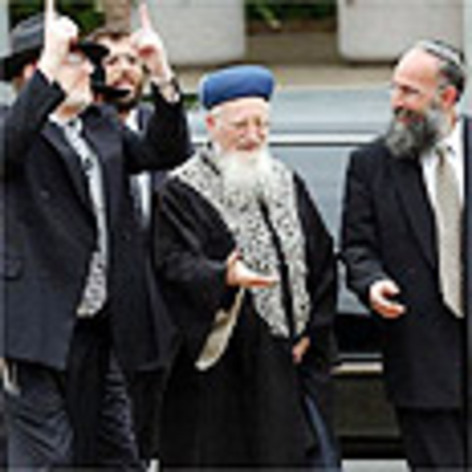 The rabbi, who served as Israel's chief rabbi in the 1980's, is currently considered one of the two main spiritual leaders of Religious Zionism along with Rabbi Avraham Shapira. On the eve of the Gaza disengagement, Rabbi Eliyahu led a hawkish line against the pullout and made appearances in rallies organized by settlers, at one point assuring listeners the disengagement would not happen. After his predications, which raised great hopes among disengagement foes, failed to materialize, the rabbi offered the following explanation: "I was talking about prayer, not a prophecy." Rabbi Eliyahu and his colleagues inch ever closer to jail. Rabbi Eliyahu's remarks can be read as incitement to murder. It's about time Israel's security services do so – and act against him.